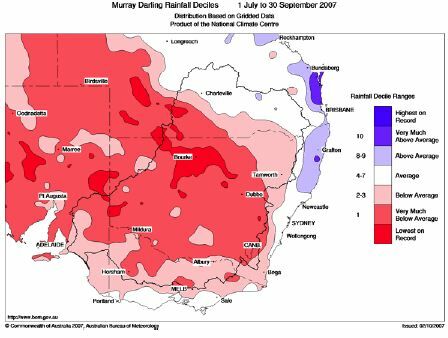 August and September were particularly dry across most of the Murray-Darling Basin. Rainfall (July-September) over much of the Basin continued below average or very much below average, with patches of lowest on record in northern NSW. Fourteen children in and around Mona Vale have developed cancer in the 10 years since a medical supplies company there began discharging a gas associated with the disease, and two of the children live less than a kilometre from the factory. But the company that operated the plant, Unomedical, said no cancers can be attributed to the emission of ethylene oxide, which was listed by the World Health Organisation as a carcinogen, reported The Sydney Morning Herald (14/8/2007, p.1). The government was trying to sell the APEC summit as producing tangible outcomes, not just an esoteric debate about aspirational goals and no binding targets, reported The Australian Financial Review (10/9/2007, p. 14). APEC has set specific goals: The government strategy was based on the fact that APEC itself had set energy efficiency and reforestation targets that Foreign Minister Alexander Downer yesterday said were “specific goals that mean things to people”, the newspaper said. A major step forward? According to The Australian Financial Review: “These goals include reforesting a minimum of 20 million hectares in the Asia-Pacific region by 2020 (which would absorb about 1.4 billion tonnes of carbon, which is 11 per cent of the annual total CO2 emissions of the world) and improving energy efficiency in APEC countries by 25 per cent by 2030. A Phillipines President Gloria Arroyo welcomed climate change discussions at APEC but said the key forum for final negotiations remained the United Nations Framework Convention for Climate Change, which next meets in Bali in December. Australian officials had drafted am APEC flexible deal that stopped short of setting long-term goals for emissions reductions, accommodating the concerns of developing APEC countries, reported The Australian (6/9/2007, p. 1). Draft rewritten: Instead, they wanted to put energy efficiency, which involved reducing fuel use to cut greenhouse emissions, as the centrepiece of prime minister John Howard’s APEC climate change initiative. The draft text on Howard’s Sydney Declaration on climate change, which was being debated by officials, had been significantly rewritten since an earlier version was leaked by Greenpeace two weeks ago.